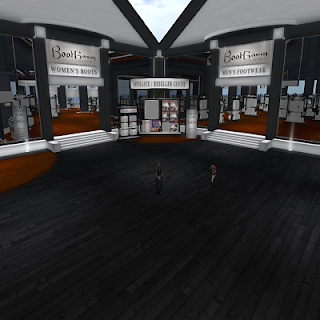 In our virtual world we have many options for clothes, accessories, footwear and more. 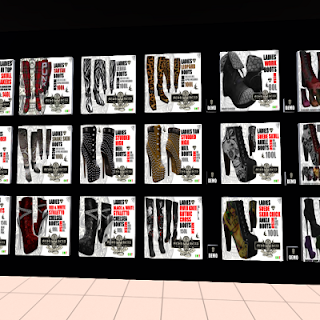 I love the variety of footwear in SL and I must admit I`m a sucker for a nice pair of boots. I like when women wear boots too. I own quite a few pairs of boots in SL and know just where to shop for them. Here are the top five stores I like most. Drakke Designs opened its doors in 2009 and has a wide variety of boots, some of which have unique designs you won’t find anywhere else. Starting in the ladies section they have ankle boots, knee high boots, fetish, and thigh high boots. Moving over to the men`s section they have cowboy boots, biker boots, and some knee high boots as well. Drakke Designs has a sister store Shade Design and they provide boots that match some of that store`s outfits. Alongside the boots Drakke also sells chopper motorcycles and its sister store Shade designs. Each store has a raffle for a 500L gift cards. It only takes a pick and group membership which costs 25L for each store but they also have group gifts as well. Drakke also has Midnight Mania boards, and every weekend they have a board where they sell some of their designs for only 60L. Make sure you are in the group because they send a notice out showing what items are on that sale. Bootgasm has a range of great boots. Their boots run the gambit from casual to fancy as well as winter boots. They have ankle, knee high, and thigh high boots for the ladies. For the men they have cowboy boots and biker styles. They also have midnight Mania boards and a monthly group gift that you pay 1L and it gets reimbursed. Bootgasm also has lucky chairs with boots on them which you need to join the group for. Mesh Head brings a unique style that is all their own for the biker or Goth style seekers. They have ankle boots and over the knee boots for ladies that have skulls and other Gothic type images. Some of their outfits are complete with the boots or shoes. 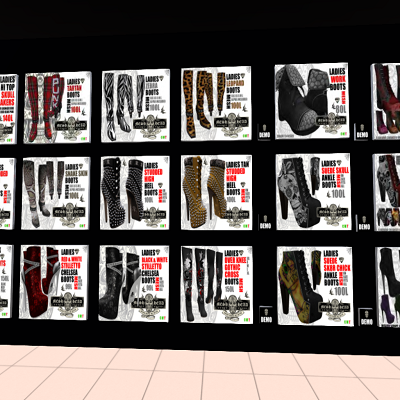 Some styles of his boots and shoes come with slink appliers. On the men’s side they have combat and biker boots some with skull designs as well. Shey Couture which I was introduced to when my wife went there for freebie heels and boots. They have ankle, mid calf, knee high, and thigh high boots done couture style. Most of their boots feature a color change hud. This feature is perfect if you want more bang for your buck. The new releases are found right at the landing point of the store. There are a lot of trendy styles at Shey Couture are 99L. Shey also features new releases often and if you subscribe to the group you will receive note cards with the textures and links to marketplace. Blackburns boots are mostly ankle boots and some knee high boots. Their style is kind of Goth,yet kind of old school saloon girl style ankle boots, also some gothic style knee high boots. They have a lot of freebies on marketplace and in the entrance to their in-world store. If you're looking for Goth, cheap but fairly well done then this is the place for you.